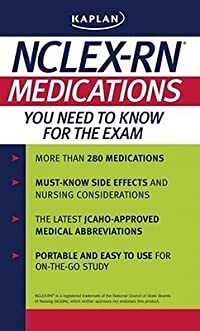 This targeted guide provides nursing students with 280 frequently tested NCLEX-RN exam terms, including medications plus their common names, drug family, and side effects, as well as an appendix of medical abbreviations. "Kaplan NCLEX-RN: Medications You Need to Know for the Exam "is the perfect companion guide for students on-the-go who are already preparing for the NCLEX-RN exam. The new format features two terms on one side of each page, with the explanations on the other. The book is grouped by medicine category.